Thursday 14 July – and in the House of Commons all of the stages of the Sovereign Grant Bill are rushed through in one sitting and it now heads off to the Lords. In the debate following the allocation of time motion it is obvious that MPs were not happy with this arrangement and it is unclear why there was any need for such extraordinary procedures. The more I look at this issue, the more frustrated I become at the lack of political attention being paid to it. The bill provides a new method of financing the Monarchy through a Sovereign Grant (full details of the proposals are on Treasury website) which is to be calculated based upon the annual revenues of the Crown Estate. It is this linkage that is most problematic and it is important first of all to clear this matter up. In the debate, a number of MPs claimed that the Crown Estate revenues belong to the Monarch and are only handed over to Parliament at the discretion of the Monarch at the beginning of each reign. The fact is that the revenues of the Crown belong to the Crown which is a constitutional entity represented by the Sovereign. The surrender of the revenues at the beginning of each new reign is part of the UK constitutional settlement and there is no constitutional option for the Monarch to refuse to surrender them (see pages 4-5 of this historical essay). The idea that any Monarch would refuse to hand over the revenues is no more credible than that the Queen would refuse Royal Assent for a Bill passed by the UK or Scottish Parliament. Indeed, George Osborne claimed that such an eventuality would be “pretty theoretical” (col 536 Hansard). The fact is that Crown revenues derive from the times when the Monarch governed the country. With the development of Parliamentary democracy, the Monarchy no longer pays for HM Ambassadors, HM forces, HM prisons and so on. The Crown revenues have always been used to finance the running of the State and thus they continue to form a legitimate contribution to the running of the country. But the reason I am writing this blog is to highlight the virtual certainty now that the Sovereign Grant Bill will pass into law essentially as it stands and that the link that has been established with the Crown Estate revenues is both wrong and deeply problematic from a Scottish perspective. It is particularly unfortunate that this link has been established at just the time when efforts are underway to end the Crown Estate Commissioners’ role in administering the Crown Estate in Scotland. There are two main issues here. The fact that a link has now been established between the revenues of the Crown Estate and the Monarchy confuses matters, muddies the waters and makes it more difficult to extricate the Scottish Crown Estate from the control of the Crown Estate Commissioners. As I indicated in my previous post, there is no more logic to linking the Sovereign Grant to the Crown Estate than there is to linking it to the profits of the Stilton cheese industry. Indeed George Osborne himself made a startling admission in the debate. So the link is simply “not a bad proxy”! A link to GDP would be far more logical and Ian Davidson MP made that very point. Unfortunately, George Osborne’s invitation for other suggestions will not change his mind because there are more powerful forces behind this link as hinted at in my previous post. The 1760 settlement whereby George III surrendered the Crown revenues in exchange for a civil list covered only the revenues from the English Crown. The Scottish Crown revenues continued to be paid to the Baron Court of the Exchequer in Edinburgh as they had always been (indeed this arrangement lasted until 1832 when the revenues began to be paid to the UK Exchequer). Thus Scotland’s Crown revenues, (some of which continue to flow directly into the Scottish Consolidated Fund via the Crown Office in Edinburgh), have never formed part of any deal in relation to the civil list. It is inappropriate thus that they be included in this new specious linkage. Labour tabled an amendment to introduce some additional linkage to GDP but this was defeated. Ian Davidson was the only Scottish MP to speak and he made some valuable contributions and indeed suggested that it be far preferable to make the link with GDP. Angus Brendan MacNeil attempted an intervention but failed. No Scottish Liberal Democrat MPs spoke. 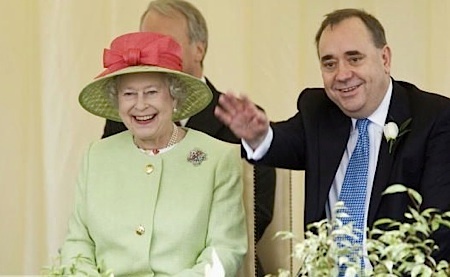 What we should have had was an agreement that the Crown Estate revenues from Scotland would be exempted from the formula and the Scottish Government should have been quicker of the mark when this proposal was first mooted back in October 2010 to say unequivocally that Scotland’s share of supporting the costs of the Monarchy should have no link to the Crown Estate. We now have a situation the revenues of the Crown Estate in Scotland now form part of a formula over the sovereign grant. This is entirely novel, has no historical precedent and is deeply unhelpful. Still, perhaps the House of Lords will retrieve matters.